Programme (ICDP – Norway/UK), Asociación Vivir (Ecuador), and A Child’s Garden of Peace (USA) to meet this challenge. SD Canada is the Canadian NGO supporting this initiative. Illène Pevec, (Child’s Garden of Peace) says, “Our entire working team is in Subud and it has been a fabulous experience to date.” Illène’s role in the project is implementing a kitchen and community garden initiative, which supports families to grow their own fresh vegetables and fruit. 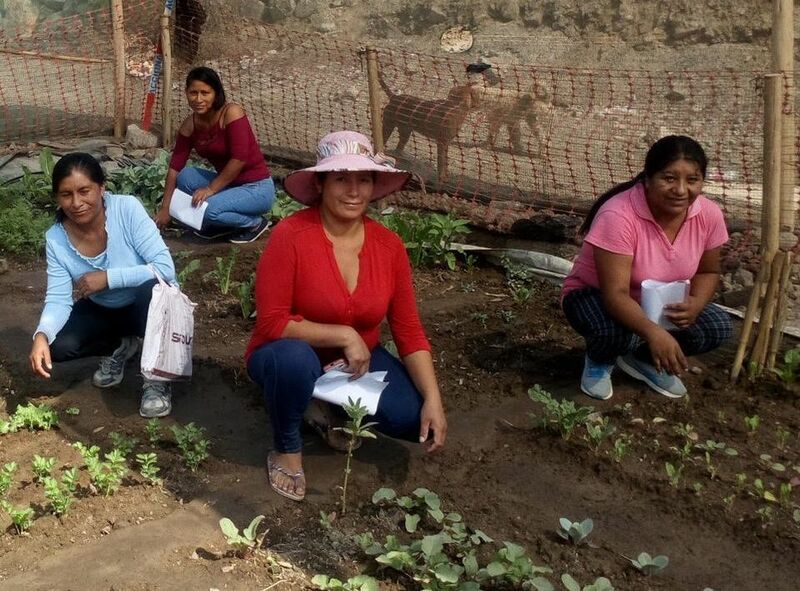 Illène has been training community health educators (promotoras), to help families with their home vegetable garden boxes. Illène is planning to go back to the field this Fall when she hopes to lead a tree planting campaign, and also to carry out a count of vegetables growing in each household. "We promised to plant a tree for every family and a few at each preschool. We already planted 2 fruit trees at the Niña Maria preschool last November. The San Juan preschool is in a barren moonscape except for the new community garden we put in directly in front of it. I want to put two large container gardens on the patio of that preschool. We would make them out of shipping pallets. The biggest cost would be hauling in soil. The growing season in Peru is year round and is best in fall, winter and spring due to brutal solar radiation in summer but the patio is covered and we already have installed a water spigot and hose there. The teachers were keen for this to happen to green their site." Our grand challenge: Sign up to help Illène and her team plant fruit trees! $20 funds a tree! And it gets you membership in SD Canada.